At the Mobile World Congress 2017, the main star of Samsung’s show was the Galaxy Tab S3. The tablet had been long overdue, with the only tablets that came out in 2016 being refreshed versions of the 2015 model. 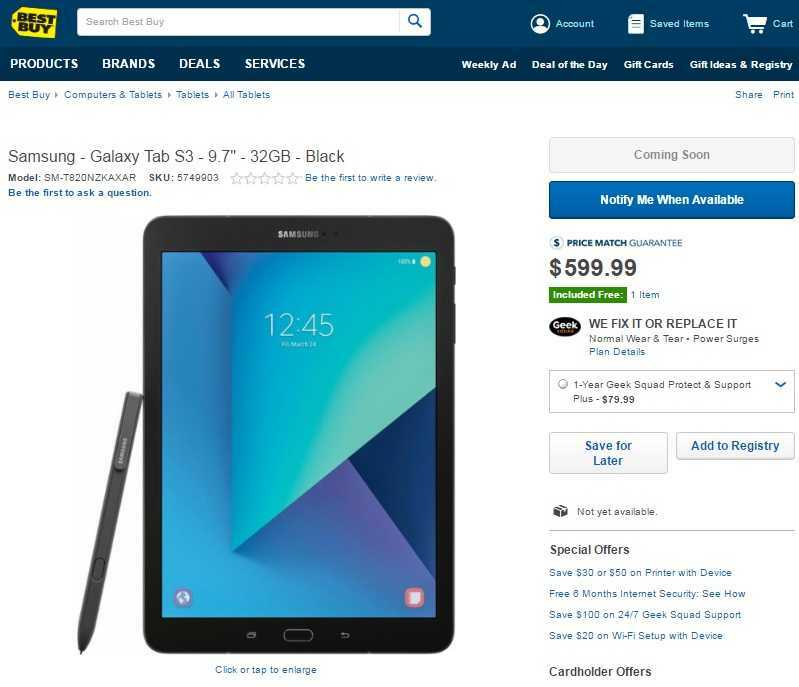 Despite unveiling the Galaxy Tab S3, Samsung did not make the device available for purchase immediately. But as at the time of this writing, you can actually pre-register to get notified when the Tab S3 is ready for shipping in the U.S. thanks to Best Buy. In order to take it off the retailer’s shelves, you’ll need $599.99, however, be warned that the tablet is not yet available immediately. Best Buy is only letting you show your interest in the tablet by registering to receive a notification when the tablet starts selling. Best Buy will be shipping the new Samsung Galaxy Tab S3 alongside a USB-C cable, S Pen as well as a Power Adapter. Samsung has never released a so-premium tablet like the Galaxy Tab S3, featuring a metallic body that boasts a glossy finish on the back, ending up with a nice-looking device that also feels great to own. In terms of specs, the Galaxy Tab S3 has a decent 9.7-inch Super AMOLED display screen that boasts a resolution of 1536 x 2048 pixels. If you loved the performance of the Galaxy S7 and S7 Edge, you’ll love what the Tab S3 has to offer in terms of hardware specs. There’s a Qualcomm Snapdragon 820 processor under the hood and this is paired with a 4GB RAM. In terms of internal storage, you get 32GB and if it’s not enough, feel free to get a microSD card of up to 256GB. The back of the Galaxy Tab S3 has a glorious 13MP shooter that promises the best shots from a Samsung tablet ever and it gets even better when it comes to the 5MP selfie sensor. To keep the tablet alive is a 6000mAh battery unit and this is charged via a USB-C port. Software-wise, you get Android 7.0 Nougat out of the box. The tablet has two variants – Wi-Fi-only and LTE – but both variants have a fingerprint scanner, as well as Pogo keyboard support, among other specs.